You are in a new relationship. You are getting to know one another, enjoying each other’s company and looking forward to spending more time together. But suddenly it is the holidays and you are faced with questions more suited to a deeper relationship. Are you going to see each other for the holiday? Are you ready to meet his family or to introduce him to yours? Are you exchanging gifts? If you have children, how is your relationship going to change their holiday? The early months are crucial in creating the right foundation to build your relationship but the stress of the holidays can send it into a tailspin. The following tips can help. ** Discuss family holiday traditions before deciding to spend the holiday together. ** You might have different religions, beliefs or traditions surrounding the holiday. Tell your new partner about your family traditions and what they mean to you. Explain what traditions mean the most to you. Ask your new partner about the traditions and customs he grew up with and why they are important to him. If you do decide to spend time together during the holidays, understanding the different family traditions will help reduce the stress. Giving gifts in a new relationship can lead to awkward moments. What if you buy a “token” gift but are given a lavish gift? What if it is the opposite way? What if you have a gift, but he felt it was too soon and didn’t buy you a gift? What if your new partner doesn’t place a high emphasis on gift giving but your family goes all out? As with traditions, talk about gifts ahead of time. You might come up with a price limit, skip gifts altogether or decide to pool money that would be spent on gifts and donate it to a cause you both believe worthwhile. Meeting the family is always stressful but doing so during the holidays is even more so. There are parents, grandparents, aunts, uncles and cousins who could be around during the holidays. Are you ready for your new partner to meet all of these people? Are you ready to meet his extended family? 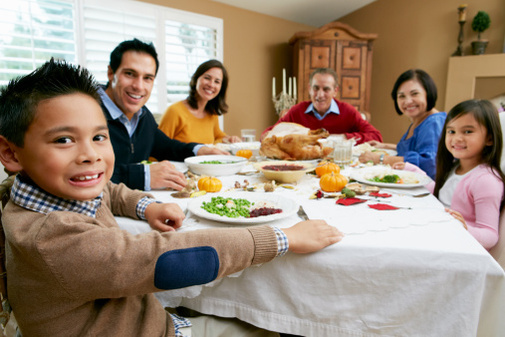 If you are planning on meeting family during the holiday season, try to arrange a small gathering with the most important family members first. This might be a quiet dinner at your favorite local restaurant or a dinner at your place or his. Meeting parents and siblings first is usually easier than meeting the whole clan at one time. Pay attention to the details when meeting the family. If your mother plans to make sure he has a present on Christmas morning, let him know so he can have a small gift for your parents as well. If you are spending the night at one house or another, respect the household rules for sleeping arrangements. Keep displays of affection to a minimum until you know what is appropriate. Discuss family dynamics before so you understand if there are certain topics you shouldn’t bring up or if there are family members that don’t talk to others. The more you know, the less embarrassed you will be. Offer to help – with cooking, cleaning up or whatever else needs to be done. If you or him have children, it adds a whole different meaning to meeting the family. Many people don’t believe in having new romantic interests meet their children until the relationship has reached the serious level. If this is a new relationship, you probably aren’t there yet. But, that means you will need to choose spending your holidays with your children and not your new partner. If you do plan on having your new partner there, talk to your children ahead of time. You might want to ask them if they mind if your new friend comes to dinner for the holiday to show that their opinion matters. Don’t feel like you need to invite him to any party you were invited to, especially the office party. If you have just started dating, it is appropriate to show up alone. Bringing a new romantic interest during the holidays signifies a level of seriousness in the relationship. If you aren’t ready to declare the relationship as a “keeper,” attend parties yourself and accept that your new partner has every right to do so as well. Watch your alcohol consumption. Alcohol seems to free flowing during holiday parties and might sound like a good way to relax and reduce your stress level. It isn’t. Alcohol can lower your inhibitions and cause you to do something embarrassing or inappropriate. This isn’t what you want your new partner to remember about your first holiday together. Limit yourself to two drinks. Make time for romance. No matter what your plans and whether or not you decide it is time to meet the families, make sure you set aside time to spend together and alone. If you choose to spend the holiday separately, you with your family, he with his, find time to do share some holiday traditions together. Spend time talking about religious traditions and sharing some with one another. Bake holiday cookies together, go to a holiday concert. Incorporating the holiday into your plans can help you start to build your own traditions. Eileen Bailey is a freelance health writer. She is the author of Idiot's Guide to Adult ADHD,Idiot's Guide to Cognitive Behavioral Therapy,Essential Guide to Overcoming Obsessive Love and Essential Guide to Asperger's Syndrome. She can be found on Twitter @eileenmbaileyand on Facebook at eileenmbailey.